Frank Lloyd Wright is one of America's greatest, possibly the greatest, architect with a larger than life personality and ego as well as a life of drama and tragedy and scandal, all of which holds our imagination. But above all, his innovative designs continue to fascinate the public. Just think of New York's Guggenheim Museum -- the circular building itself is a sculptural work of art. Then there is the amazing Fallingwater house built over a waterfall in the Pennsylvania woods, his Taliesin and Taliesin West, on the Wisconsin prairie and in Scottsdale, Arizona, which served as a laboratory for his ideas about architecture in harmony with the environment. And then we have his time spent in LA, during which he built a number of important houses and nurtured the careers of at least three of LA's signature architects: Rudolf Schindler, Richard Neutra and John Lautner. Some of Wright's buildings, now historic sites, marked his birthday milestone Thursday with parties and $1.50 tours. Visitors were permitted to take pictures inside the home, which is usually not allowed. Other exhibits and events are being offered into the summer and fall, including a major show that opened Monday at New York's Museum of Modern Art called Frank Lloyd Wright at 150: Unpacking the Archive. The exhibition runs through October 1, and showcases Wright's drawings, 3-D models, furniture and other materials. It also emphasizes his talent at salesmanship. He appeared on the cover of Time magazine in 1938, and took part in the 1950s TV game show What's My Line? where blindfolded celebrity contestants guessed Wright's identity by asking questions. Hollyhock House, built from 1919-1921, is a significant project of Wright's, even though he was fired in the midst of the project. He had been hired by oil heiress Aline Barnsdall to design an arts and theater complex that was never built because of cost overruns. She fired Wright over his inability to deliver the theater, and donated the present building to the City of Los Angeles in 1927. Over the decades since it has served as an art gallery for different organizations but was damaged in the 1994 Northridge earthquake. It underwent numerous restorations, and in 2007 it was designated a National Historical Landmark. 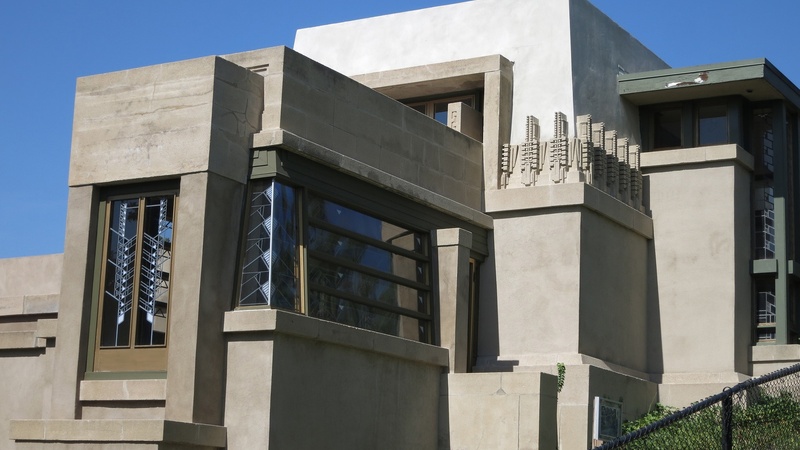 "Hollyhock house doesn't look like a house," said Jeffrey Herr, the curator of the Hollyhock House. "It looks more like a temple and specifically some of its lines look very much pre-Colombian. If you've ever been to any of the ancient Mayan sites in Mexico or seen photographs of them, it clicks." Wright came to Los Angeles at a low point in his life -- his lover and her children had been murdered by an enraged employee -- and some critics read into his LA houses a heaviness that they believe reflects his spirits at the time. Besides the Hollyhock House, there are several houses in Los Angeles that are worth checking out, including the Ennis House in Los Feliz. It's one of four houses Wright built in LA using textile blocks -- concrete block with decorative relief patterns. The others are La Miniatura, the Freeman House and the Storer House. It was a way for Wright to challenge himself. He's quoted as saying, "What about the concrete block? It was the cheapest (and ugliest) thing in the building world. It lived mostly in the architectural gutter as an imitation of rock-faced stone. Why not see what could be done with that gutter rat?" His experiments with textile block weren't entirely successful. His concrete blocks houses leaked and had other problems. But they are amazing to visit or to check out in movies they've starred in. Being in Los Angeles, it was only a matter of time before Hollyhock House was re-purposed as a movie set. In 1989, the building was used as the Piranha Temple in the cult classic film Cannibal Women in the Avocado Jungle of Death starring Bill Maher. The Ennis House was used as a location for Blade Runner and the TV series Buffy the Vampire Slayer.